1. Capcom (Creators of Commando) - The makers of the world's classic shooter game. Click here! 2. Mame (Multiple Arcade Machine Emulator) - Thanks to the work of these talented programmers, thousands of classic games, left to collect dust and disappear, have been restored to work again on pretty much every computer system in existence. Thanks for the incredible job you have done in saving the beginnings of video gaming for future generations. 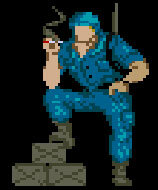 Commando and others will still be great games, no matter how 3D the future games are. If you still have not experienced the Mame Program, please visit them at once. Click here! 4. The Arcade Flyers Database - A link to this site for allowing me to take some of the flyer pictures in their database for use with my Commando webpage. They deserve the credit for collecting and restoring thousands of arcade posters, pictures, and flyers. Click here!